I'm not sure if this is indeed a *world* phenomenon, but it's a pretty big deal in London. All over the city, kids have dressed up as their favorite book character. Elliot - it will come as no surprise - chose Superman. This is my first adventure into the world of costume-for-school making and, while I didn't do a bad job, it became painfully obvious that I need to learn to sew. There's only so much double-sided tape in the world and I'm pretty sure I used at least half of it in the past few days. Reference material (Thanks Aunt Goose for the book!) and supplies. I went a little crazy when buying the material. Before I came to my senses (or acknowledged my skill level), I thought I could fashion a whole, Super costume. The symbol of truth, justice, and the American way. Made from construction paper. Super construction paper. Clark Kent, an integral part of the costume. This was my creative suggestion to the costume. 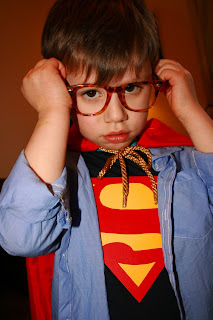 I thought it would be hilarious for Elliot to be both Clark Kent and Superman. In reality, it's probably a nightmare for his teacher since he'll just want to loose the shirt and glasses as soon as his class starts. I also contemplated twisting his hair into a glossy front curl, but stopped myself just in time. Pretend you're in a phone box and become Super! Fly away to save the day. It's hard for Superman to remain incognito with a red cape. I love love love it! I think you did a great job on the costume. Especially the "S"
I love it! My favorite shot is Elliot on his bike with the cape peeping out. A problem I am sure Young Superman had all of the time. It is hard to be Super, but still be protected from the elements. The Clark Kent at School shoot is too perfect. 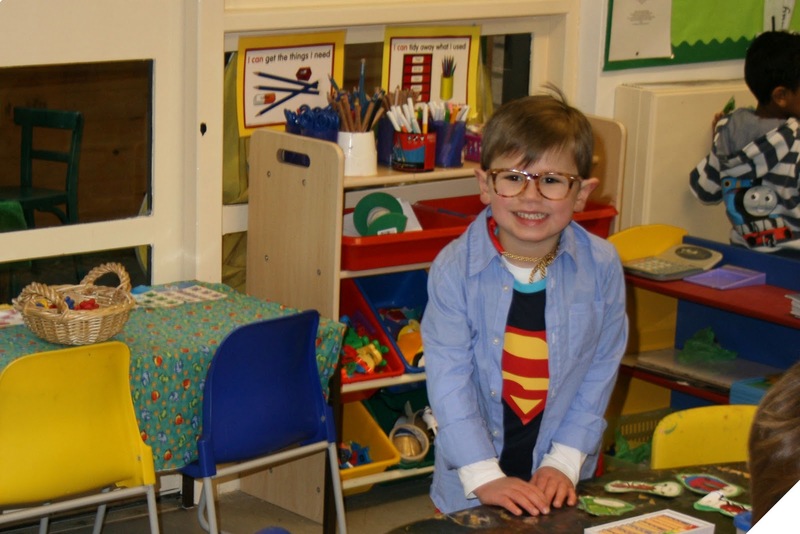 You pulled off a great Superman outfit, Andrea! Well done :) Yes, I do agree the Super "S" was the best and made the outfit. The school shot was also "super" -- Elliot looks really happy, but so old with the glasses. Is he really just about 4, only?